Best Indoor Cycling Bike Under $200? 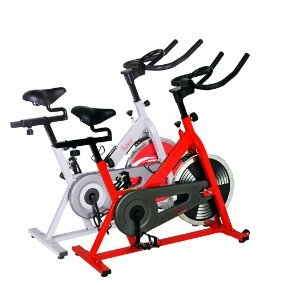 Sunny health and fitness SF-b1001 is probably one of the best indoor spin bikes on the market. Especially, for its price. However, What else makes this bike better than other spin bikes? If you’re looking to lose weight then spinning or indoor cycling some might say is one of the best and most fun ways to achieve a flatter stomach! The reason why spin is so good for weight loss is it’s incredibly simple to perform HIIT (high-intensity interval training) that is well known for burning more calories than your standard cardio. For less than £200 you really don’t need to pay out expensive gym fees when you can get your desired weight from the comfort of your living room. What Makes The SF-b1001 So Good? If I didn’t tell you it was under $200, you may have thought this would be in the £500-£1000 price range. Sunny Health & Fitness stand by the quality of the products and ensure each and every time you get a built to last product, because if this quality guarantee sunny Health &fitness are one of the quickest growing fitness brands in the USA. SF-b1001 is no exception, with adjustable seat and handlebars it provides comfort to all users while its heavy duty frame and crank will see it last with heavy usage! 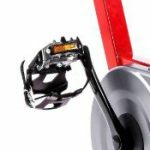 They also realise you need a strong flywheel for intense workouts that’s why they have added a chrome 30lb adjustable resistance smooth but quite wheel. For convenience, they have added wheels on the front to make it easily portable. How Are They Able To Provide Such Good Quality With Low Prices? Good question I thought the same, Sunny Health & Fitness operate from California for the last 12 years but they import products from China and Taiwan. Don’t let that put you off as you can ensure your only getting the best-engineered products; this is how they bring reputable but good products to your door. With Sunny Health & Fitness SF-B1001 Spin Bike you receive 90-day manufacturer’s warranty. Extremely! All the instructions and tools you need come with the product and you can easily assemble it on your own should take you no more than an hour. If you do struggle, then youtube has an excellent guide on how to build it just see below. I have used many spin bikes, the good the bad and the damn expensive ones, and this for the price is bloody brilliant. The only real gripe I have is it has no console to give you useful information such as RPM, distance, calories burnt and distance. What does impress me is the quality of the build for such a little price, normally the experience wouldn’t be smooth and somewhat clunky, but you genuinely get a real good indoor cycle experience. This is an absolute gem to help you on your way to next level fitness and overall weight loss. “I researched several bikes before purchasing this one. I am a college student and needed my exercise schedule to be more flexible. Obviously, being in school I needed something cost efficient. This bike it absolutely perfect! great quality. I have previously rode several different bikes and this one has been my favorite. There is a spot for your iPad and I have downloaded spin apps that allow me to watch classes while I spin. The best part of all is that it works for short people! I am 4’11 and it is PERFECT for my size. My roommate is 5’8 and the bike works perfect for her too! When I received the bike and put it together I realized that one pedal was stripped and would not screw in properly. I called amazon and they were SO helpful! By noon the next day I had received a brand new bike. 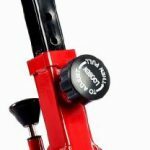 I don’t ever write reviews but I felt like this time I should for all the others looking to purchase. Buy this one, youwon’tt regret it one bit!! I’ve had this stationary bike for about 2.5 years now, and it’s still running fine. Granted, I have gone a few long stretches without using it. The only wear and tear I can notice is slightly more noise while the wheel is turning, and a loud squeak when adjusting the tension knob. I can probably fix it with some machine oil. The bike is lightweight and moves around easily when you need it to. It might wobble a little while you’re riding it sometimes, but that’s more of an indication that your form is getting sloppy. I really enjoyed reviewing this indoor bike as it refreshing to see something relatively cheap and still good quality. 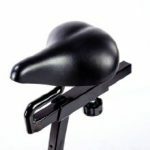 Putting the bike to one side spinning is a great exercise for any fitness goals especially weight loss, sure there are better bikes out there but not for this price its a real bargain. Apart from the seat which can be uncomfortable and the lack of a console, you will have a bike to last you a long time. I highly recommend Sunny health and fitness SF-b1001, to get the most competitive price click the button below! Most effective parts is Pros & Cons. overall excellent review about the bike. Love this article most and would like to recommend. Its a nice review with lots of variations. Your criterion for a good product was more based on the price and I missed the material aspect a little bit. You can elaborate a little more about that. The sunny SF -B1001 is made up of a steel frame and chrome flywheel you will find some plastic on there such as the portable wheels. When I see the pic I really thought it is above 500$ but apparently I am wrong. I know that its steel construction is amazing and I also used other products (bodybuilding) of sunny healthy fitness. It was amazing experience. It is definitely one of my choices now.